The Winton track organisers have taken steps overnight to eradicate the issues with debris experienced during practice yesterday. Earlier this year the circuit was resurfaced and is producing high levels of grip and spectacular lap times. However, the high grip level has meant drivers are tackling some parts of the circuit with more speed, pushing the track limits and dragging debris onto the track – particularly at turn eight. The issue was highlighted in the post-practice press conference last night, particularly by the two fastest men Tim Slade and Shane van Gisbergen – and steps have been taken to curb the issue so the racing is as exceptional as expected this weekend. “The guys have done an amazing job and created one of the best racing surfaces we race on,” Supercars Chief Operating Officer Shane Howard told supercars.com. “That’s created a lot of grip that has changed the characteristics of how some of the drivers are driving in different turns, and it has highlighted the issues of bringing material back onto the circuit. “The lessons from that – the loose material at the rear of the kerb needs be stabilised. The best solution for this is for concrete to be installed behind the kerb and at the track edges. Benalla Auto Club Group Chief Executive Officer Chris Lewis-Williams explained in detail what had been done overnight as a short-term temporary solution. 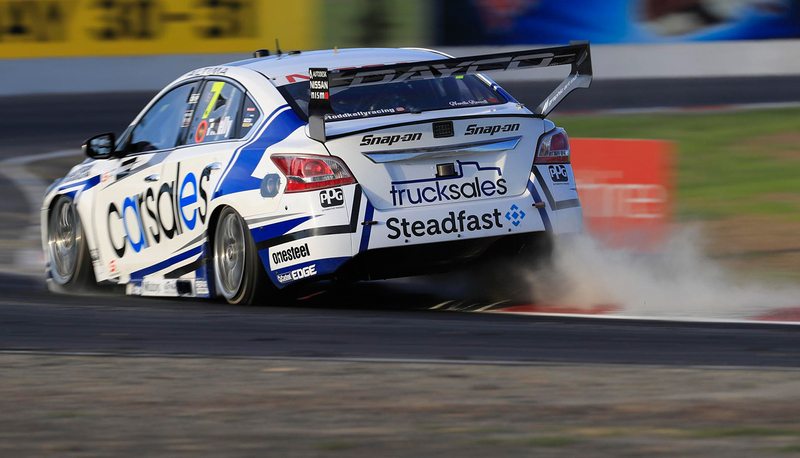 While there were some small issues during the testing at Winton, turn eight was not expected to be a problem. “We attended the drivers briefing last night and took the comments on board,” Lewis-Williams explained. “So we got the boys and their shovels, their brooms and their equipment last night and they swept all the loose material at least one metre back from the kerb. “So … now, if they happen to drop a wheel, there’s not something light that can get dragged across. All the loose stuff has gone and we’ve now gone down to a crust. “We believe that is the temporary best solution for now and then we’ll look at a long term solution going forward – which would be concrete. Despite the dust yesterday, the cars were still producing record times, with a number of cars running below the previous lap record set in 2014. Slade set a new benchmark with his 1min19.2435 lap yesterday, and said he wouldn’t be surprised if the number was lowered again today.